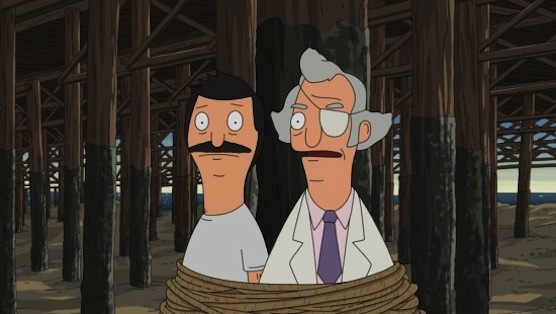 The conclusion to the (not really) nail-biting cliffhanger from last week’s Bob’s Burgers didn’t pack as meaty of a comedic punch as its predecessor, a fairly understandable letdown after the high of Part 1. But I still can’t shake the small bit of disappointment that lingers, and I also wonder if my respect for the first installment of this two-part season finale would have lessened if this were an hour-long block TV rather than being portioned out. Or would I have liked tonight’s episode more? They figure out something is amiss, but the next text—which features a shrimp emoji and the word “Pierre”—leads them to a restaurant where Teddy chokes out the maître d. (Tina: “He even told us to come back any time. Class act.”) They split up, eventually converging on the wharf where Felix bows under the weight of his guilt and goes to try and rescue his brother and Bob before it’s too late. This sets up one of the funniest and most heartwarming sequences of the episode as everyone takes paddleboats out to save Calvin and Bob, and then Felix’s crazy diva girlfriend shows up whipping a gun around because she was promised a nightclub and recording studio at the new wharf space. “Okay,” she tells the Belchers, “you get in the water and drown.” It would all be silly if it weren’t for Bob and the family pronouncing their love for each other for what they are sure is the last time. It’s another highlight of how the show allows some real sentiment to creep into the goofy, ironic, and sometimes cynical hive mind of the show. The writers never let you forget that this is a family that really cares about each other. Naturally, everyone makes it out in one piece, with the girlfriend sent up the river for trying to murder six people. And the Belchers are together again, heading off to huddle in bed and eat croutons together. Let’s let that wonderful image linger in our heads for the next eight months or so while we wait for Season 5 to get underway.